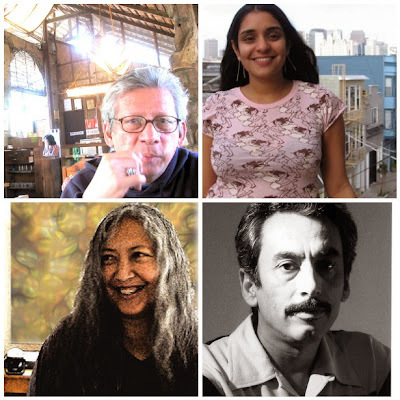 Who: Writers Neelanjana Banerjee, Luis Francia, Alejandro Murguía, and Jean Vengua. Musical guests Bo Razon and Carlos Ziálcita. Neelanjana Banerjee’s poetry and fiction have appeared in the The Literary Review, Asian Pacific American Journal, Nimrod, A Room of One’s Own, Desilit and the anthology, Desilicious. She received an MFA in Creative Writing from San Francisco State University in 2007 and was a Hedgebrook fellow in 2008. Banerjee has worked in mainstream, ethnic and independent media for the past ten years. She edits the Books and Literature section for Hyphen (an Asian American magazine based in the San Francisco Bay Area) and is currently a teaching artist with the San Francisco WritersCorp. She is a co-editor for Indivisible: An Anthology of South Asian American Poetry (University of Arkansas Press, 2010). Luis H. Francia is the author of, among other titles, the poetry collection Museum of Absences, the semiautobiographical Eye of the Fish: A Personal Archipelago, and the forthcoming chapbook The Beauty of Ghosts. He is the editor of Brown River, White Ocean, an anthology of Philippine literature in English. He teaches at New York University and Hunter College. Alejandro Murguía is the author of two collections of short stories, both of which received The American Book Award, Southern Front (Bilingual Review Press 1991) and This War Called Love (City Lights Books, (2002). He is also the author of the non-fiction The Medicine of Memory: A Mexica Clan in California (University of Texas Press 2002). A long-time literary activists in the Bay Area, he is the co-editor of Volcán: Poetry from Central America (1984); the translator of Angel in the Deluge by Rosario Castellanos (1993), and the founder and editor of Tin-Tan Magazine (1975-79). He is currently a professor in Raza Studies at San Francisco State University. Jean Vengua's poetry has been published in many print and online journals and anthologies, including Going Home to a Landscape, Babaylan, x-stream, Interlope, Returning a Borrowed Tongue, Fugacity 05, Sidereality, Moria, and Otoliths, and in her chapbook, The Aching Vicinities (Otoliths). With Mark Young, she is editor of The First Hay(na)ku Anthology and Hay(na)ku Anthology, Volume 2. Jean's essays, articles and reviews on literature and music have been published in many journals including Jouvert, Geopolitics of the Visual (Ateneo Univ. Press), Pinoy Poetics, Our Own Voice, Seattle's International Examiner (Pacific Reader), and CultureCatch.com. Carlos Ziálcita, harmonica player and vocalist, has been part of the San Francisco Bay Area music scene for three decades as a performer, promoter, educator, and radio announcer. His recordings include Train Through Oakland in 2000, Evolution, released in 2004 and Soul Shadows, released in 2009 with the jazz fusion group Little Brown Brother. He is the Producer and Executive Director of the San Francisco Filipino American Jazz Festival.